Golden Fluid Acrylics are available individually in 30ml bottles, and also in additional larger bottles of black and white. Two assorted sets are also available: a set of 10 30ml bottles and a set of 8 15ml bottles. The Fluid colours can be mixed with most of our other GOLDEN Mediums, Grounds, Gessoes, Gels and other paint lines, including Heavy Body Acrylics, High Flow Acrylics, High Load colours, Iridescent colours, Paste Paints and Matte Acrylics. By blending paint lines of different viscosities, artists can create virtually any paint consistency without sacrificing colour strength. The Heavy Body Acrylics can be thinned very effectively with water, but since the Fluids start at a lower viscosity, less water is needed. Remember: the more water added to the acrylics, the greater the subsequent shrinking of the paint layer. Too much water will reduce the binding capability of all of the acrylic paints and also tends to flatten out their sheen. The Fluids can be poured and puddled, dripped and dragged onto the canvas to achieve some unique effects. By altering the speed, the distance from the substrate and nozzle size or shape while pouring, one can control the size and shape of the resulting pour or drip. Working with different Fluid colours together, either simultaneously or at different times, can be an interesting technique. There are a few GOLDEN mediums that work especially well with the Fluids for various pour/drip/puddle effects. Clear Tar Gel mixes with the Fluids for dripping purposes, and can yield lines that range from spider-web fine to brushstroke thick. In keeping with the standards created by GOLDEN's Heavy Body Acrylics, when formulating the Fluid line we consciously decided not to add the flattening agents or opacifiers typically added to other acrylic paints. Such fillers are frequently added to unify the sheen of a line of paints and to make all colours uniformly opaque. We decided that each pigment would be made to its own level of matte or gloss and its own unique degree of opacity or transparency, depending upon its own intrinsic nature. These decisions have allowed the colours to retain their clearest and cleanest quality, especially when used in washes or glazes where their brilliance is displayed. It is always possible to add matting agents and other whitening materials to the product, but once added, it is impossible to take them away. Because the Fluid Acrylics contain no flattening agents or opacifiers, it is quite evident when looking at a painted colour chart that the colours do vary in gloss. For example, the Ultramarine Blue or Raw Umber appear quite matte, while the Dioxazine Purple and Vat Orange are extremely glossy. Although some artists find this variation problematic, many artists appreciate the nuances of colour, sheen, and transparency or opacity that exist within the Fluid line. The Fluid colours retain excellent flexibility when dry, greatly diminishing the likelihood of the cracking that occurs in other natural and synthetic polymer systems. The acrylics can absorb the constant stress and strain placed on canvas when shipped or as it expands and contracts with changes in temperature and humidity. Please note: acrylics begin to harden at 15 degrees Centigrade or 59 degrees Fahrenheit, and become quite hard at temperatures below freezing. This is especially important to remember when shipping a painting in freezing conditions or when unrolling a painting that has been kept in cold storage. The paint will not spontaneously crack when frozen, but because it will be very brittle, care should be exercised in handling. When a painting has been exposed to such cold conditions, it is important to allow it to warm sufficiently before rolling, unrolling or any other handling occurs. The Fluid Acrylic line, although smaller in colour range than the Heavy Body line, contains a wide variety of pigment options. Many artists have wondered why we do not include all the Heavy Body colours in the Fluid line. There are many reasons preventing us from doing so. Because of the consistency of the Fluids, some of the heavier metal pigments do not remain stable in the thinner consistency. The heavier pigments may tend to settle out, densely packing on the bottom of the container where they cannot be restirred very easily. Viscosity stability is a common problem, as it is often difficult to maintain such a low viscosity (thin paint) with such a high pigment load over the course of time. The Fluid Iridescent colours are one of the most unique products available to artists today. They are well-known for their luster quality and offer highly reflective metallic variations. They can be used alone or mixed with other GOLDEN colours. Adding glossy gels or mediums to Iridescent colours will also increase their luster quality. Most of the Iridescent Acrylics are made from mica particles coated with Titanium Dioxide and are very resistant to fading. Some are made from metal and metal oxides, such as Iridescent Stainless Steel and Micaceous Iron Oxide. The Iridescent acrylics will not oxidize or tarnish since they are made from stainless steel, naturally occurring minerals such as mica, or fully oxidized materials. The GOLDEN Interference colours achieve their reflective properties by synthetically reproducing a natural phenomenon-the nacreous, or pearlescent, quality found in fish scales, peacock feathers or the dust of a butterfly's wing. Golden produces 6 Fluid Interference colours and four Interference Oxide colours in Fine consistency only. All of GOLDEN's Interference colours produce a luster quality by themselves, or when mixed with other colours and mediums. Every colour within the Fluid Line is approved for professional artist use according to ASTM Standards for Artist Materials. These standards regulate paint consistency and demand fineness and lightfastness of chosen pigments, use of 100% acrylic binder, freeze-thaw stability, and accuracy of labeling for pigments used. Evaluation by an approved toxicologist is required. Of the 51 colours currently in the Fluid line, 45 are considered excellent in lightfastness (the ability to withstand colour change due to exposure to light). The remaining 6 are rated very good for lightfastness. GOLDEN does not use any colours within the Fluid line rated less than very good. Those colours rated as very good include Green Gold, Naphthol Red Light, Naphthol Red Medium, Hansa Yellow Light, Permanent Green Light, and Dioxazine Purple. 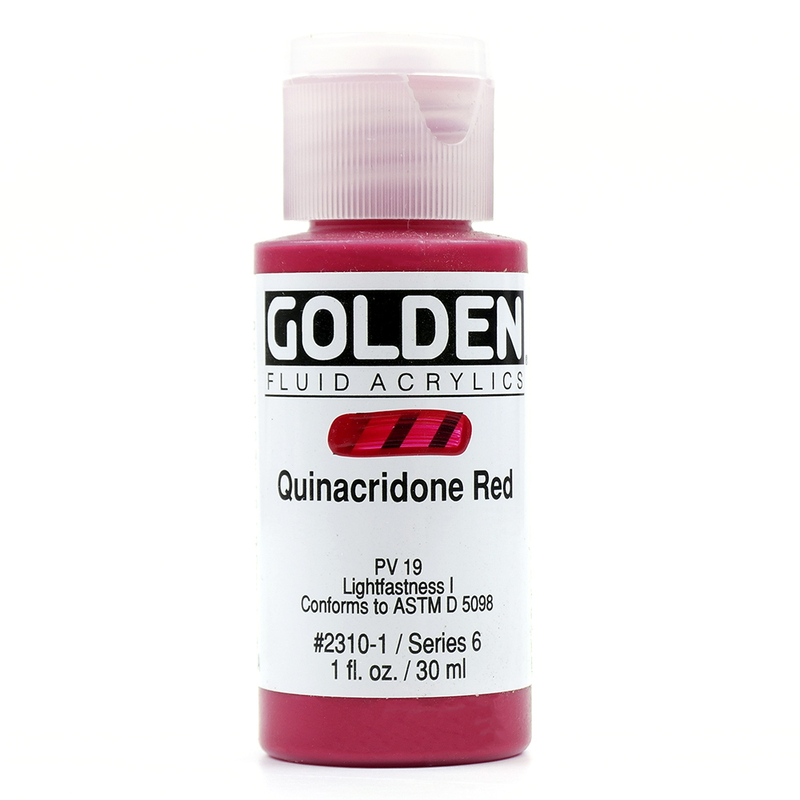 The GOLDEN Acrylic lines contain more Quinacridones than any other acrylic line of paint. Quinacridone pigments produce seven intense colours ranging from deep yellow to vibrant violet. All of the Quinacridones, because of their vibrant undertones and high transparencies, tend to be excellent mixing colours. They tend not to muddy or gray, retaining their brightness. The Phthalocyanines are known as the oldest organic pigments. The GOLDEN Fluid line contains 5 Phthalocyanine colours, including Phthalo Green (Yellow Shade) and Phthalo Green (Blue Shade), Turquois (Phthalo), and two Phthalo Blues, (Green Shade) and (Red Shade). These different Phthalocyanine colours actually contain the various pigment forms of the Phthalocyanine group. The Cobalt Fluid colours include Cerulean Blue and Blue Deep (these contain both Cobalt and Chromium), and Cobalt Blue.